I am a lucky person – and I know it. I went through a major health scare last week and while everything is okay, I came out of the experience with a newly found appreciation for how awesome my life is. We have everything we need: money is not a big problem, we have a great family support system, my friends are wonderful, my blogging business is booming and we have our health. Some people aren’t as fortunate. I’ve always given to charity and tried to help friends out, but I feel like I need to do more. 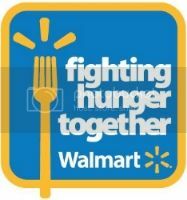 One of my most shopped at stores, Walmart, is working with the Feeding America organization and ten of the most recognizable food companies in America this spring to launch the third chapter of the Fighting Hunger Together initiative. The Fighting Hunger initiative is focusing on helping hungry families across the United States. Did you know that according to the USDA, more than 50 million American homes are dealing with hunger? More than 16 million of those are children! As a mother – and as a human being – it breaks my heart to know that there are hungry people in my community, in my state – and in the same world that I live in. I know it seems that America is the land of the excess, and while for some that may be true, there are people among us that are struggling to feed their families on a daily basis. Between April 1 and April 30, the Fighting Hunger Together initiative will deliver $3 million in grants for hunger programs, generating millions of meals for local Feeding America food banks and their partner agencies across the U.S.
Go online for the opportunity to join the fight against hunger and help distribute grants to local communities across the country. Volunteer at a local hunger relief organization. Angeline already knows about the issue of hunger in our community. One of her best friends in middle school was facing a really hard time in her family when her mother lost her job. While they waited for their assistance to be approved, their refrigerator and pantry was severely lacking. I wanted to help by bringing them groceries, but her mother would not accept it. We got creative and bought them a grocery store gift card, saying that we were given it and didn’t shop at that grocery store. Angeline knows firsthand that there are families struggling in our own community – sometimes it’s closer to home than you might imagine. I told Angeline about the Fighting Hunger Together initiative while we were out grocery shopping and she helped me vote for a Feeding America food bank in Florida. As a mom, it is heart breaking to have to talk to your kids about the sad realities of the world around us, but I think it’s really important to teach our children at a young age that there are families less fortunate than us – and that there are a million little ways that we can help, even if we don’t have the resources to help in big ways. Vote and volunteer to fight hunger this spring with Walmart! Visit www.walmart.com/hunger and cast one vote per day for Feeding America food bank or their partner agency in local communities across the country. The 100 winning food banks or partner agencies will share $3 million in grants to fund hunger relief programs!! They will be announced in May. I implore you to pledge to volunteer at your local hunger relief organization by visiting www.walmart.com/hunger. The closest participating organization to me is the Davin Joseph Foundation in Tampa, so that is who I will be voting for each day! I’d love to know if you voted and why you voted! What a great cause. It is so important. Awesome program! Seems like a great and easy way to give back! Glad to see Walmart giving back. I’ll be sure to vote everyday! I’m about to vote now for the Houston Food Bank. It’s just so sad that there are so many who go hungry every day. It’s great to see Walmart giving back to those in need. Hunger is such a horrible epidemic and in a country as prosperous as the US, it should be non existent. It’s unbelievable how many people really are hungry. It truly is hard to believe how many people go hungry. This sounds like a great initiative! It’s hard to believe so many go hungry. This sounds like a great initiative on Walmart’s part.